(1564- 1642) was an Italian physicist, mathematician, astronomer, and philosopher who played a major role in the Scientific Revolution. His achievements include improvements to the telescope and consequent astronomical observations, and support for Copernicanism. Because of his criticism of an earth centered universe, Galileo was placed under house arrest. 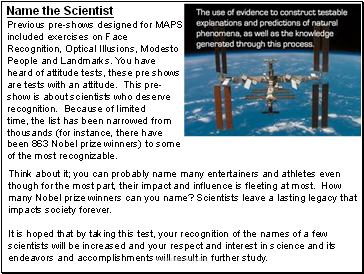 In 1992, the Catholic church apologized for their censure-ship of Galileo. Until the time of Galileo, European scientists relied largely on Aristotle's approach of philosophical analysis to explain physical phenomena. 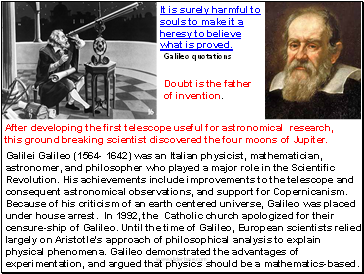 Galileo demonstrated the advantages of experimentation, and argued that physics should be a mathematics-based. 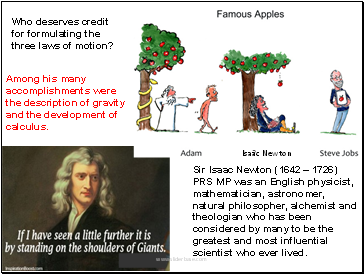 (1642 – 1726) PRS MP was an English physicist, mathematician, astronomer, natural philosopher, alchemist and theologian who has been considered by many to be the greatest and most influential scientist who ever lived. 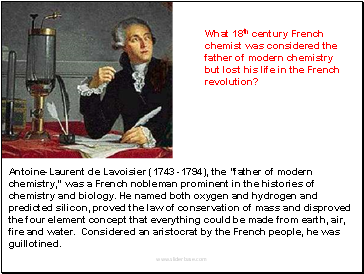 (1743 -1794), the "father of modern chemistry," was a French nobleman prominent in the histories of chemistry and biology. He named both oxygen and hydrogen and predicted silicon, proved the law of conservation of mass and disproved the four element concept that everything could be made from earth, air, fire and water. Considered an aristocrat by the French people, he was guillotined.